We continue to see interest in the EM Spectrum multitouch exhibit that we developed with Adventure Science Center late last fall. The exhibit was featured on the popular Engadget blog and our video on YouTube just this week surpassed 40,000 views. Today, I posted a case study about this exhibit on the ExhibitFiles website, under Space Imaging: Multitouch Multiuser Exhibit. 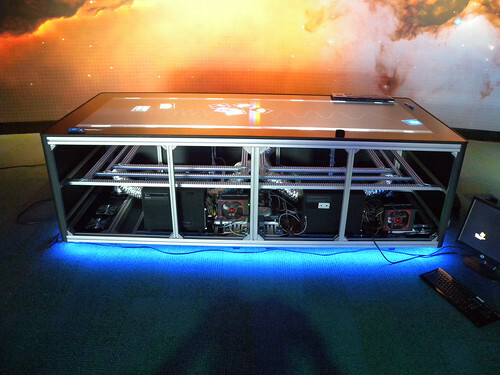 In addition, we’ve decide to post a couple of pictures showing the inside of our 100″ multitouch table on the Ideum Flickr page. Hopefully, these new posts will help explain more about how the exhibit was developed. 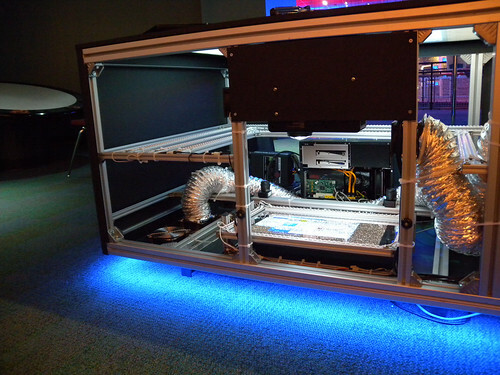 As you can see from these pictures, we used infrared LEDs and a dual computer and projector system to create our optical sensing system. Find more about the inner workings of the table on our Flickr site by clicking the photos above. What isn’t shown is the exhibit software, which was developed in Adobe Flash and uses our GestureWorks multitouch framework for Flash. You can learn more about that on the GestureWorks site. Category: Design, Exhibit Files, Exhibits, Gesture Works, Multitouch, Museums, Science. Tags: adventure science center, astronomy exhibit, gestureworks, interactive exhibit, multiouch exhibit, multitouch table.